Great landscaping and décor liven up any outdoor design. With the right landscape design, your outside space will be both beautiful and functional. More importantly, great décor makes any landscape design more enjoyable. Contemporary design schemes this year focus on multi-functional designs so, whether you add outdoor blinds for shade or lush plants for beauty, continue reading to learn some easy ways to design the perfect outdoor space this year. When you start your outdoor design, first create a focal point that draws guests to a certain area. 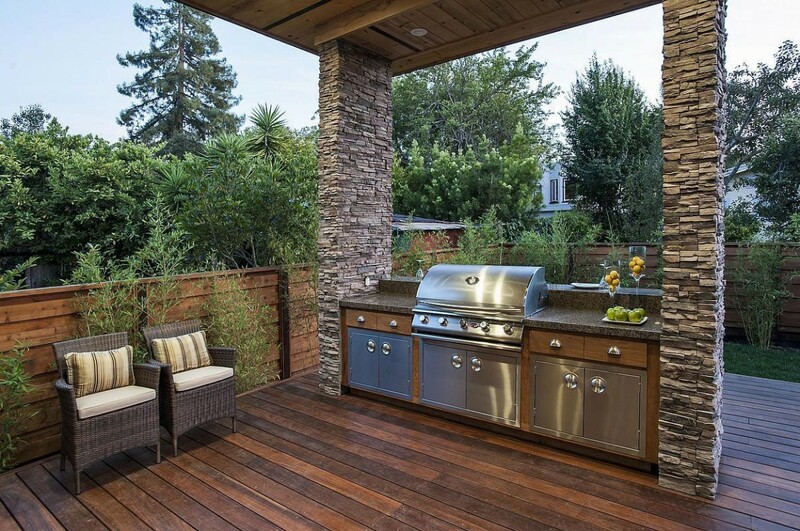 If you are someone who loves to fire up the barbeque, then invest in an outdoor kitchen that allows you to grill and cook. For homeowners with a pool, create a nook where people can gather and talk while splashing around during the summer months. Showers are also very nice for rinsing off after a swim. Alfresco dining and entertaining is always welcome in areas where weather permits. For example, an outdoor movie room is easy to set up with the right accessories. Huge outdoor seating pillows along with outdoor mats or rugs make for a warm and cozy environment. Alternatively, if you like outdoor shindigs, consider setting aside an area to dance. If relaxation and comfort are your priorities, consider upgrading your usual patio furniture for a design created for enjoyment. Consider color combinations that are both interchangeable between seasons, but also add pizazz. For instance, add pops of summertime color such as red, yellow, blues and greens in your pillows and other accessories. Then, in the fall, simply switch out those accent colors for magenta, burnt orange, and burgundy. One of the major trends in outdoor design involves a multi-functional approach of both comfort and function. Many online sites feature homes landscaped to perfection! However, they also include options for more useful purposes such as patios and decks that include areas for cooking, dining, and conversation. Another theme that seems to be a part of the outdoor deco trends is low maintenance designs. One example is to use outdoor furniture that is easily stored or withstands the extremities of the summer and winter months. Another low maintenance idea is to set potted plants around that add natural beauty yet are easy to maintain. Outdoor settings are truly a joy to design. Whether your landscape or patio leans towards the classics or relies more on contemporary outdoor décor, use these suggestions to create an excellent outdoor space that provides both comfort and function for seasons of enjoyment for you, your family, and guests.